Many organizations are struggling today with methodologies to develop knock-out innovations; Innovations that really can be game changers, innovations that really shake-up the market. One such approach might be a creative look at your actual quality aspects: yes, indeed, issues falling under ISO etc. Quality aspects, all issues that ensure that a customer gets what he or she expects, are essential for the success of an organization. However, quality aspects occur, develop, grow and change. If an industry has gotten used to certain quality aspects, “In our industry, this is the way we do things!”, it might be the right time for an innovative game changer. Launching a product with ‘deviant, abnormal, scandalous’ differentiating quality aspects, might shock the industry incumbents, but might on the other hand just delight customers. 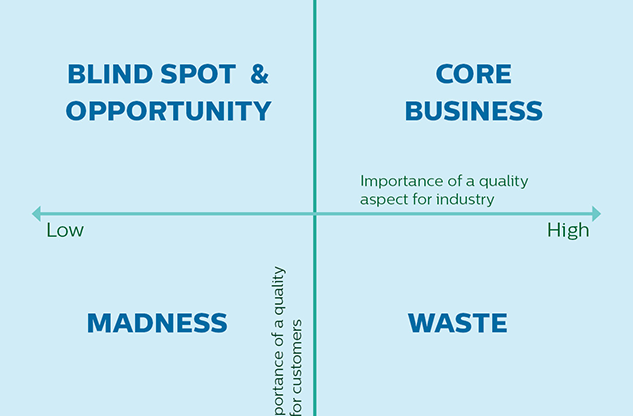 When plotting quality that an industry considers important versus quality that a customer really considers important, we can distinguish four situations (see Figure). Core business is the quality well-delivered by a company and well appreciated by its customers, like the leading Swedish car manufacturer on safety. Madness can be seen as pursuing a quality aspect that is neither considered important by industry, nor appreciated by customers. And it does happen! Waste is devoting substantial effort on a quality aspect that is not appreciated by the customer, although the company thinks so. 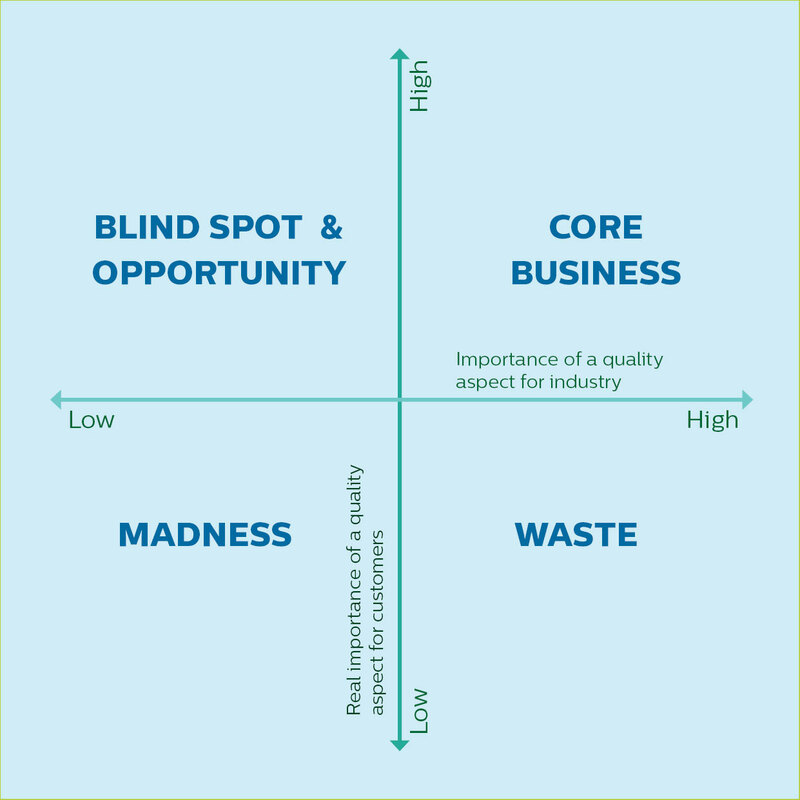 Blind spot & opportunity is the quadrant we should pay attention to. That is where the game changers are! A blind spot was lack of real attention for consumer wishes. The effort that a brewer put into making a 100% naturally brewed non-alcoholic beer was a waste. Natural was seen as sign of quality. The consumer was looking for 0% alcohol, not necessarily naturally brewed. A competitor did understand that quality aspect, making their malt beer a big success. In a completely other field, cheese innovation was a great example of seeing an opportunity. The cheese industry was paying limited attention to innovative processes for ripening cheese. “The customer wants old cheese through long storage! That is a sign of quality!” It was their blind spot. The innovative cheese maker’s team developed a new approach to ripening. This created a great opportunity and competitive advantage: making a much appreciated product for substantially lower cost. If you want a knock out, game changing innovation, take a long hard look at your quality criteria. Are all criteria still essential for your customers, or have some become superstition or rituals?